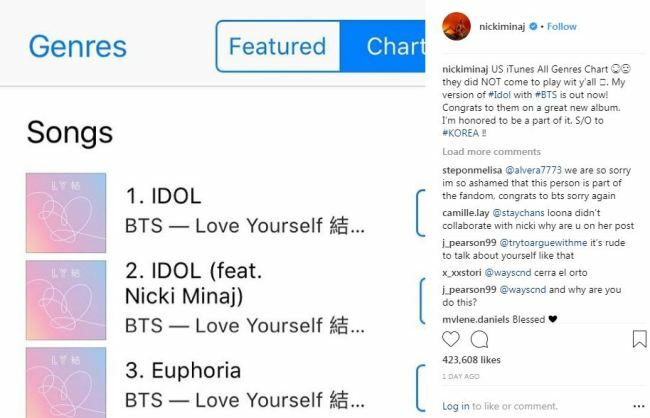 US rapper Nicki Minaj recently posted on her Instagram page a screenshot of BTS’ new album tracks sweeping the US iTunes Songs chart. The screenshot shows BTS’ title track, “Idol,” in first place. Fans can also see a special version of “Idol” featuring Minaj alongside the band. “Congrats to (BTS) on a great new album. I’m honored to be a part of it,” Minaj wrote on her post. Since BTS released its repackaged album “Love Yourself: Answer” on Friday, its tracks are dominating music charts domestically and internationally. The music video for “Idol” broke the record for YouTube’s most viewed video in a 24-hour period, hitting over 50 million views within 20 hours of its release.